Charlie Howard travels the globe writing suspense novels for a living, about an intrepid burglar named Faulks. To supplement his income---and to keep his hand in---Charlie also has a small side business: stealing for a very discreet clientele on commission. When a mysterious American offers to pay Charlie 20,000 euros if he steals two small monkey figurines to match the one he already has, Charlie is suspicious; he doesn't know how the American found him, and the job seems too good to be true. And, of course, it is. Although the burglary goes off without a hitch, when he goes to deliver the monkeys he finds that the American has been beaten to near-death, and that the third figurine is missing. Back in London, his long-suffering literary agent, Victoria (who is naive enough to believe he actually looks like his jacket photo), tries to talk him through the plot problems in both his latest manuscript and his real life---but Charlie soon finds himself caught up in a caper reminiscent of a Cary Grant movie, involving safe-deposit boxes, menacing characters, and, of course, a beautiful damsel in distress. 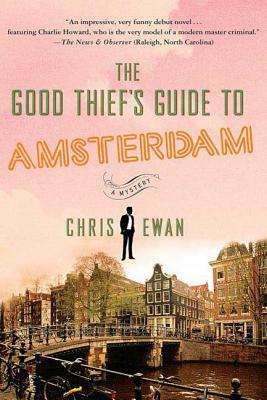 Publishers Weekly called Chris Ewan's The Good Thief's Guide to Amsterdam one of the "best books for grownups."